Gorebagg.com E.J. Gold is Gorebagg the Lost. Game designer and developer, musician, artist, Bardo trainer. Click here to find Gorebagg's ever expanding music tutorials. Yay! Gorebagg has released the Prosperity Path Gaming Orbs across the internet FREE!. This amazing technology is made available through UrthGame.com in several basic formats: Remedies, Insta-Fix, Oracles, and Cleansing. The orbs are accessible, easy to use, and Free -- all you pay is 99 cents to cover the download and hosting fee. Welcome to Gorebagg.com the home of many things Gorebagg. Can't say all things Gorebagg cause, believe it or not, inspite of the large number of topics covered on the site we are only brushing the surface. Check out the Who is Gorebagg? topic for a general overview of Gorebagg and his many endeavors. The Where is Gorebagg? topic contains a partial taxonomy giving a peek inside many of the activities that Gorebagg has, is, and will get up to. The Friends topic does not pretend to be complete. There may or may not be any rhyme or reason used in the determination of which friends are included in these pages. These friends pages will forever be a work in progress. Gorebagg has many interesting friends (celebrity and otherwise) that it will take us well into the next century to get around posting them all. Gorebagg's Blog is a mixture of material that just didn't seem to fit in one or another of his many blogs; along with reprints of his most popular articles from those same "other blogs." As a professional writer, words are definitely his forte. 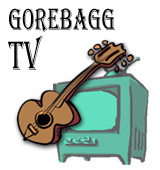 Visit Gorebagg's Links to find a collection of websites, blogs, videos, and music that Gorebagg has either recommended to his friends or been involved in as one of his many cooperative projects. Have a question? Burning to share a comment? Or, just want to touch base with Gorebagg after a few decades of water under the bridge? In any of these cases use Gorebagg's contact form.